An innovative air bed mattress that turns any standard sofa (minimum 60" between the arms) into a queen size 60"x 80"x 20" high guest bed. This remarkable air bed mattress sets up, tears down and stores away in minutes. With EnduraEase, there's no need to turn away guests for lack of sleeping space or guest beds. 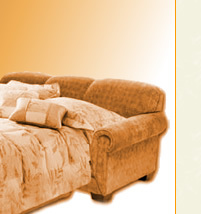 Treat family and guests to a comfortable night sleep in your home. Discover a new freedom to accommodate guests at the drop of a hat! 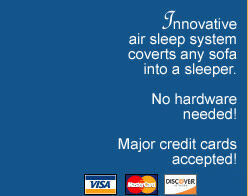 Your guest will be pampered and you'll be amazed at this innovative concept in air bed mattress sleep systems. The mattress is covered for a one (1) year period. Warranty issues will be resolved with replacement of the mattress, no returns. This warranty only covers defects in material or workmanship and only to the original owner. Copyright 2006-2007 Seating Systems, Inc.